This was painted in oils on a 20" x 16" canvas. 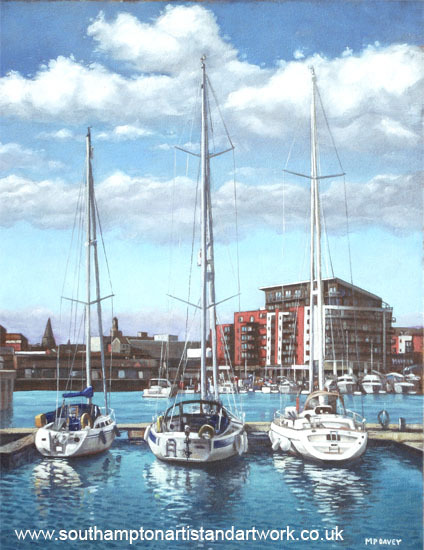 This depicts the recent redevelopment of part of the docks at Southampton, UK. This part of the docks was the first to open in 1842 and used for commercial shipping. It was redeveloped in 1986 for leisure use. The development is known as Ocean Village and is popular with tourists and those interested in yachts. Often the area can be packed with boats squeezed in to any available space. Luxury flats, cinemas and bars populate the surrounding marina. I was drawn to the interesting mix of buildings in the distance, separated for the viewer by the expanse of water. The yachts always have their own interest when painting them-the elegant hulls and the details of the rigging. The reflections in the water are always difficult, but satisfying to paint. The artwork was completed in early 2011.